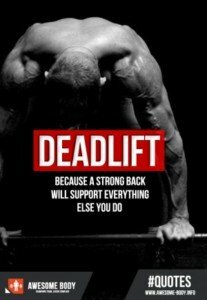 Have your fingers been hurting from the excessive pulling against them by a heavy barbell during deadlifting? This may prevent you from doing your full deadlift workout and/or from going for heavier loads. The discomfort or aching isn’t a pain per se, but a feeling that the soft tissue in your fingers is being over-stretched or excessively strained by the weight of the barbell — despite using a mixed grip. Gravity wants to pull the barbell back to the floor as you fight against it – fingers pulling by keeping gripped onto the bar. The heavier the barbell, the more forces will be imposed upon your fingers – making the palm-side hurt or ache. Do you have a tendency to shake out your hands after finishing a set of deadlifts? It’s a natural reaction to aching, strained fingers. Weightlifting gloves or powerlifting wraps may not solve this problem – and certainly won’t for those who don’t want to rely on these devices at all. Now if you’re already wearing this gear and your fingers still hurt during or after a deadlift routine, the solution is the same for you, as it is for those who go completely raw. 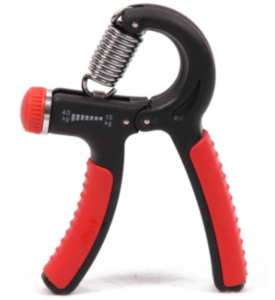 Buy a pair of hand grips with a tension adjuster. You will be working one hand at a time (not the way you’re probably thinking, though, so keep reading). Working one hand at a time is important so that you can give your best concentration. The grip tension should be no more than moderate for your subjective grip strength. • The exercise should be performed a few days after the deadlift workout, and a few days before it – but NEVER the day OF the workout or the day AFTER. • There’s no reason to do this exercise the day before, either. • Just twice a week is all it takes to solve the issue. Squeeze the grip all the way and hold for one second. Then release – but here’s the key: The release should be in slow motion. Open up your hand/fingers so that the release takes seven or eight seconds. • The tension should be light enough to enable you to repeat this for eight to 12 reps.
• However, the tension should be stiff enough to make you feel that your fingers are getting a light to medium level workout. • Squeeze at a normal rate (about a second or so), then take at least seven seconds to release all the way. • Then close the grip again and repeat. • The tendency is for people to do hand grips fast. In this case, it’s for therapy to get rid of the hurting fingers from deadlifting, NOT to make your grip stronger. • Thus, do not get impatient and rush. Again, take seven, even 10 seconds for that release. This technique puts the so-called eccentric load on the fingers’ tiny muscles – which, really, are put through so much during heavy deadlifts. Eccentric training will toughen up the fingers! Over time, increase the tension of the grip. You can do this easy exercise while watching TV. But make sure that you’re not distracted, which is why it shouldn’t be done while you’re on the phone or while driving. Do three to four sets each hand, one hand at a time. The discomfort or straining aching feeling in your fingers should start disappearing within a few weeks, allowing you to do your full deadlift routine without worrying about over-stretching finger muscles or other soft tissue. It’s worked for me like a charm. This exercise needs to be done permanently. If you quit this adjunct exercise, you’ll lose what you’ve gained. It’s part of your deadlift regimen; keep it permanent.